BRUSSELS - European leaders are wrestling over how much of their sovereignty they are willing to give up in a desperate attempt to save the ambitious project of continental unity that grew from the ashes of World War II. At stake at the summit in Brussels, which began Thursday evening, is not only the future of the euro, but also the stability of the global financial system and the balance of power in Europe. To convince financial markets that Europe's economy-crushing debt crisis is a one-time event, countries will have to give up significant powers, such as some decisions on borrowing and spending, to a central authority. French President Nicolas Sarkozy and German Chancellor Angela Merkel want to convince the other 15 eurozone leaders to agree to a plan that would require their governments to balance their budgets and accept automatic sanctions if they don't. At the same time, the currency bloc's largest economies are being pushed to commit more money to boost the eurozone's firewalls as the crisis threatens to pull down Italy and Spain. The overall plan must be good enough to convince the European Central Bank to intervene in the government bond markets in a manner large enough to stop the panic there, said Paul De Grauwe, an economics professor and EU expert at the Catholic University of Leuven, in Belgium. The president of the ECB said the bank currently has no plan to increase the scale of its bond interventions, which could keep down the borrowing costs of weak countries like Italy and Spain, as markets had been hoping. Stocks and the euro fell, while the borrowing rates for Italy and Spain skyrocketed. ECB chief Mario Draghi had hinted last week that if governments agree to tighter budget controls, the central bank might step up support. Analysts said his comments on Thursday served to keep pressure on politicians to reach a deal. 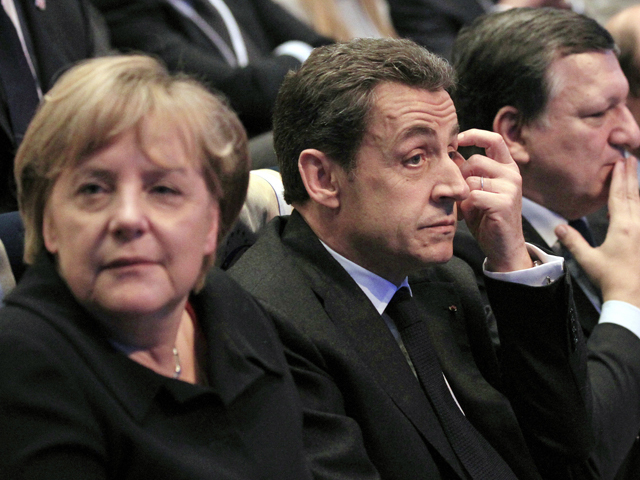 Merkel and Sarkozy want to enshrine the tougher budget oversight in a treaty, either by changing the existing EU treaty or creating a new one for the 17 eurozone nations that others could opt in to. An EU official said that in the first hours of the summit, leaders agreed that national debt brakes should limit their structural deficits to 0.5 percent of annual economic output. The official was speaking on condition of anonymity because the talks were ongoing. The 0.5 percent limit, which could only be exceeded in exceptional situations or to counteract a recession, is stricter than the 3 percent cap set out in current EU law. "Words alone are not believed anymore because too often we did not live up to our words," Merkel told a rally of fellow European conservatives in Marseille, France, ahead of the summit. Some countries resist the idea of giving up some of their control over national budgets. Furthermore, the 10 EU countries that don't use the euro are worried about being left out of important decision-making if eurozone countries adopt a new treaty of their own. European Council President Herman Van Rompuy and some smaller countries that have stuck to the budget rules in the past, meanwhile, are pushing for much more intrusive powers for European institutions to essentially take over wayward states' fiscal policies that even France and Germany are unlikely to accept. At the same time, the Germans are still opposing an attempt to strengthen the eurozone's crisis firewall. An early draft of conclusions for the summit, which was seen by The Associated Press, says that a permanent euro500 billion ($670 billion) bailout fund, which could come into force as soon as July, should not be diminished by loans already given out by the bloc's existing rescue fund. Those commitments, which already include the bailouts for Ireland and Portugal, could reach around euro200 billion once a second rescue for Greece and loans to other countries to recapitalize banks have been accounted for. In addition, Van Rompuy and several other euro states are pushing for greater help from the International Monetary Fund. Some European leaders have said that their national central banks could lend money to the IMF, which could act as a backstop for financially weak eurozone countries. An EU diplomat, speaking on condition of anonymity before the summit, said eurozone leaders are likely to agree to give the IMF euro150 billion ($200 billion) in bilateral loans to use as a firewall in the debt crisis. But officials from other countries dampened expectations that that deal could be finalized by Friday. The draft conclusions include a paragraph on increasing IMF resources, but left open the amount. The money would come from the central banks of the 17 euro nations, not governments, which are already highly indebted. The diplomat added that eurozone leaders hoped non-eurozone countries would contribute an extra euro50 billion ($67 billion). For France and Germany, however, the primary goal of the summit is changing the EU treaty in an attempt to make sure that no other debt crisis can ever happen again. If necessary, they say, the 17-country eurozone could create its own treaty, which other willing nations could join. Such a roundabout solution may be necessary because several non-euro countries  including the U.K. and Sweden  have warned that they may block treaty changes. British Prime Minister David Cameron has said he will defend his country's interests at the summit and demand safeguards if asked to amend the EU treaty. Cameron wants concessions to protect London's role as a global financial center  a demand that is being frowned upon by France and Germany. Dutch Prime Minister Mark Rutte said it is vitally important to include all countries in any new agreement. "We also have to make sure that we keep the union of the 27 together," Rutte said as he arrived at the summit. "It is not only a union of the 17 eurozone nations. It is also of the utmost importance for us that we also keep countries like Britain, Sweden and the Baltics and Poland united." Markets have mostly risen since last week on hopes that an agreement among European governments on the Franco-German plan would pave the way for the ECB to intervene more aggressively to support eurozone bond markets. However, investor optimism was deflated on Wednesday, when a German government official said it could take up to Christmas to clinch a deal, and then again on Thursday, when ECB chief Draghi lowered expectations that the central bank might step in with more help. An ECB rate cut, and more support for banks to get money flowing through the banking system were not enough to keep investors happy. Markets were hit again a few hours later, when a European regulator said banks have to raise about euro115 billion ($154 billion) to meet a new standard meant to inoculate them lenders against market turmoil, including bad government debt. That's about euro8 billion ($10.73 billion) more than what the European Banking Authority previously estimated, and bank stocks around the continent plummeted. With so much at stake on the summit's results, U.S. Treasury Secretary Timothy Geithner was zipping across Europe on a three-day trip to press the region's leaders to solve their differences. Reforms to deal with the debt crisis are "vital" but their implementation will take some time, Geithner said in Milan, where he met Italy's new Premier Mario Monti. Secretary of State Hilary Clinton, who was in Brussels, said the United States was willing to offer assistance. "But we do need a plan to rally behind, to know the way forward."